Our building project is taking on a fervor and an excitement and a red-rimmed-eyes-and-a-sun-burnt-scalpness to it that was heretofore unknown. We’re all just ready for it to be done, already! Bryan and Timothy are ready to go on to new projects. I am ready to plant my fall garden. Amalia is ready to spend her time in other (social) pursuits. Little Mack just wants to go fishing. Here’s what we’ve accomplished in the past few weeks, since I wrote last about this project. First, Bryan installed the tracks for wiggle wire. By the way . 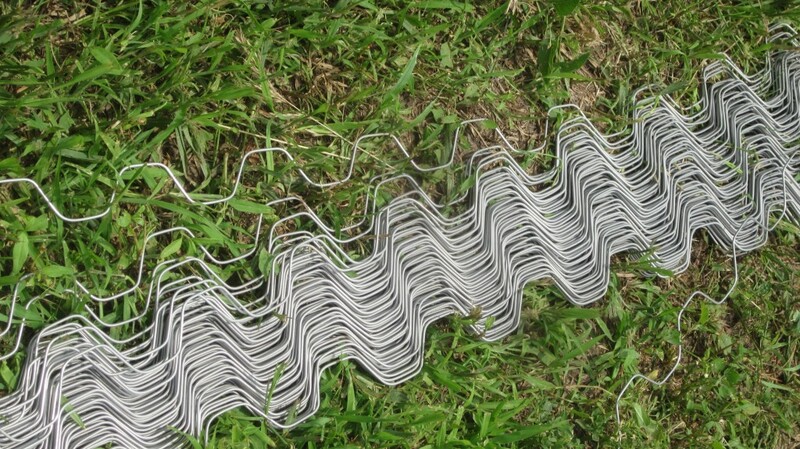 . . we’ve concluded that this wiggle wire and track system is the coolest invention ever. 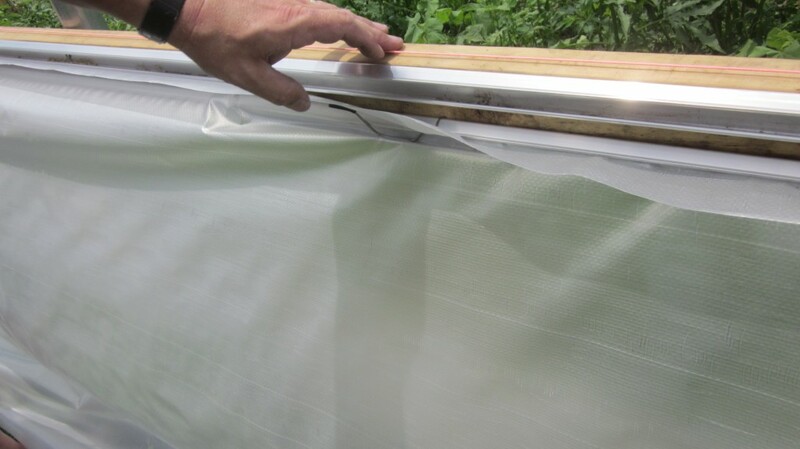 In order to fasten the plastic down to the boards, no screws or nails are used, therefore (you must agree, this is pretty cool) the plastic is not full of holes or tears. Which is a pretty important when you’re covering such a large structure with it. Bryan loves the wiggle wire so much, I’m thinking about giving him some for his birthday. 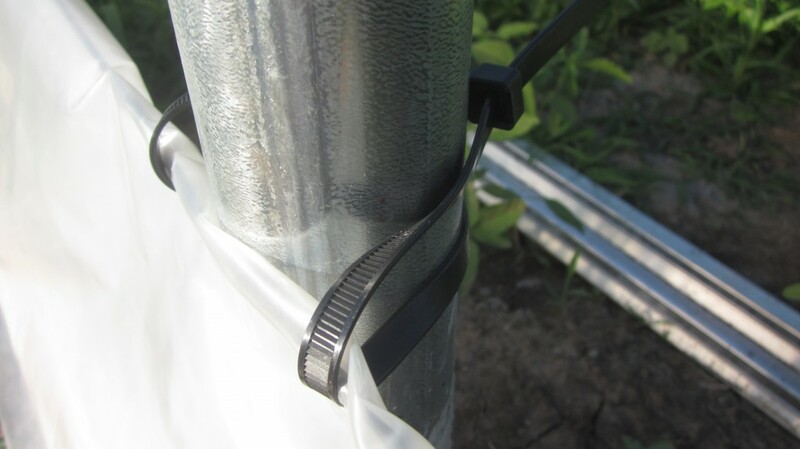 The wiggle-wire and track combo is used to hold down the mini-skirt, the curtain, the plastic on the ends, and the BIG chunk of plastic that goes over the entire top of the hoophouse and–who knows–maybe other things, too. So you know that it’s a pretty secure method. Here’s the end of one wiggle-wire before Bryan tucked it into the track. Awesome, eh? Bryan and I installed the “mini-skirt” by flopping the plastic over a wire that Bryan had installed at just the right height, and then wiggle-wiring it in at the bottom. This mini-skirt will bridge the gap between the bottom edge of the curtain, and the ground. I very very carefully cut slits in the plastic to install these zip-ties to secure the mini-skirt to the vertical posts. I really didn’t want to cut these holes in the plastic, but that’s what the directions indicated that we should do. Zip-ties make me a bit uneasy. They’re so . . . permanent, you know? Once you zzzzip them closed, there’s no turning back. The mini-skirt is on and wants only wiggle-wire installed to the bottom edge. Huzzah! The curtain goes on next, and we need a bit bigger crew to do this. Amalia and Timothy come to join us, and Mom and Dad stop by, too. The dogs are dizzy with excitement and keep treading on the plastic, and then the wiggle-wire, and then the plastic again, and then the wiggle wire again, then the plastic . . . Finally Mom takes the dogs and little Mack away from the worksite. Mom is the heroine of the day. We all applaud. 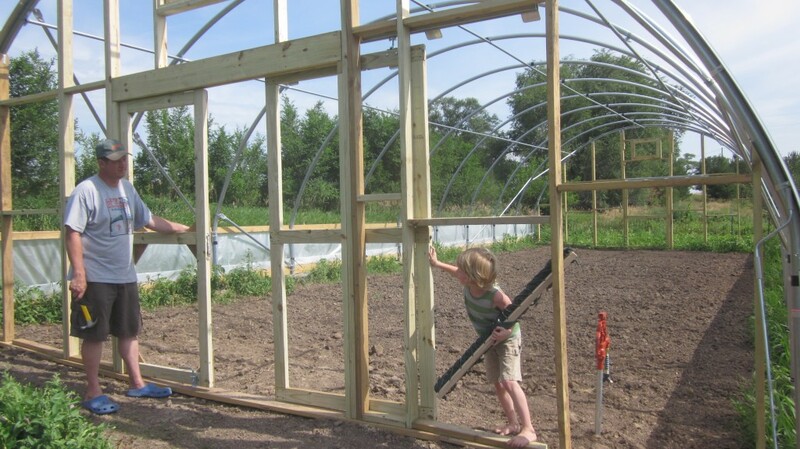 It apparently takes a village to attach the curtain to the rod, and then to install the rod to the hoophouse. Here’s the curtain going up on the far side. If you’re wondering . . . . Bryan keeps his hearing protection on at all times, just in case. The man is very protective of his hearing. Here’s the curtain going up on the near side. 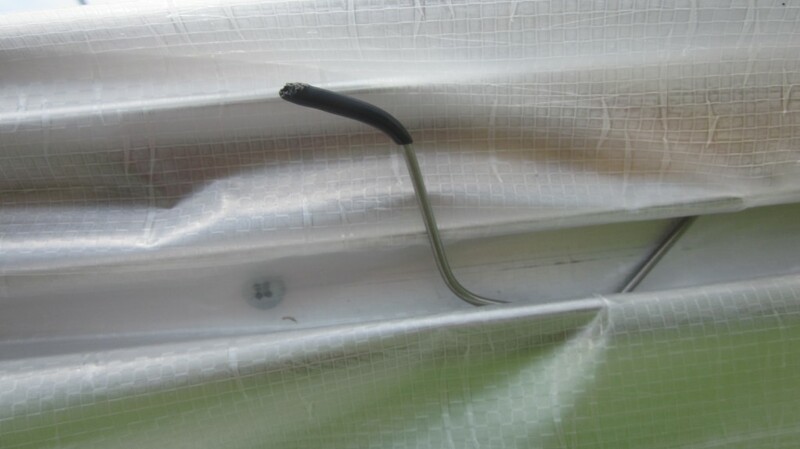 Now here’s the cool part: Timothy has attached the crank, and . . . . .
. . . up the curtain goes! The curtains (and the front and back doors, for that matter) will be opened every morning during warm weather, or else the crops inside will be toast. That is, once I get them planted! 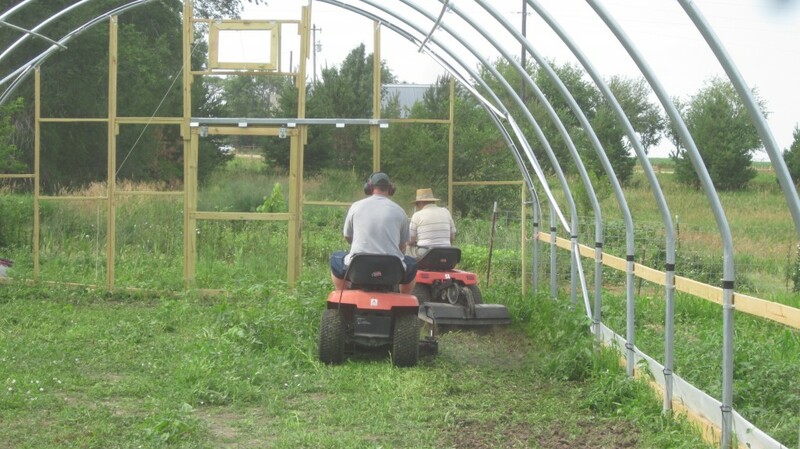 Toward that end, Bryan and Dad go to work inside the hoophouse on the weeds that have sprouted up during the building period. Bryan mows them to a manageable height, and then Dad rototills them into the soil. Ta-daa! Instant organic matter, worked into the soil. My soon-to-be-planted seedlings are so lucky. Yep, it’s that time of year out here. Time to get the mower into the garden and just start mowing . . . don’t tell me you never mow your garden?! The day after we installed the curtains, we received some good news: the guys who were going to install the hydrant were coming the next day. We’d been waiting for this for weeks, and so we are happy-dancing all over the place. Well, I am. I’ve actually never seen my dad and Bryan happy-dance. The dogs happy-dance with me, because by now Mom has let them go. Mom does a decent happy-dance, as well. Once the hydrant is in place, the guys can build in the north end. Bryan has always noted that I tend to plant things in a rather . . . crowded way. I try to pack as much in, as possible. It’s kind of a world-view kind of thing. My world is better, that is my view, if it’s packed full. Ditto on my garden. It’s not complicated. We all benefit from it. Mostly. Consequently, the hoophouse is overclose to the garden fence, which is overclose to the orchard, which is overclose to the blueberry patch–well, you get the point. 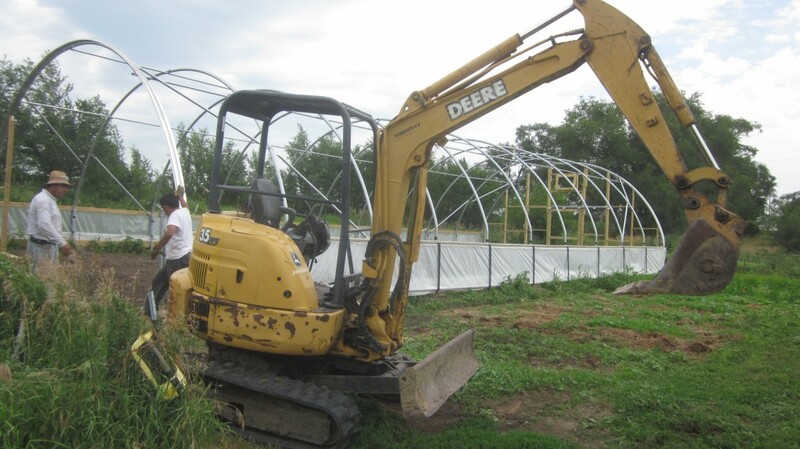 We were both a bit nervous about this backhoe fitting into the tight space between the existing hydrant, the orchard, the garden fence, and the hoophouse. Yikes! Could it be done? But the two guys who came to do the work–besides being extremely friendly and agreeable–were nonplussed and professional about it all. At least they understand my worldview. “No problem!” said Andre, grinning. And he manoeuvred that big piece of equipment around like nobody’s business. I was so impressed, I almost forgot to be nervous about it all. He came within inches of all the obstacles without breaking a sweat. Little Mack and I took turns running out pitchers of ice water and slabs of cold watermelon to these guys, in the hopes that they wouldn’t faint of heatstroke and end up in bottom of the deep hole that they were digging. I couldn’t help but peer down into that deep hole several times, just for the shivery aspect of it. “I’m always on the lookout for buried treasure,” I admitted to Andres. He laughed, but not like he thought I was crazy. Like he was enjoying the thought. “If we find it, can we have half?” he asked immediately, grinning. Oh well, anyway, it didn’t happen–yet! 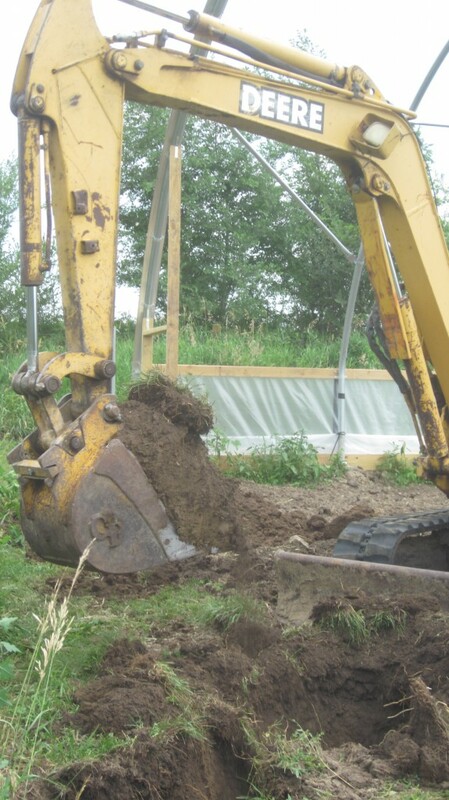 But if there’s a chest (or several) full of pirate treasure buried someplace on our acres, we–are–going–to–find it! And more than likely, it will be with the help of these fellows: Andres and Arturo. Back to the hoophouse. 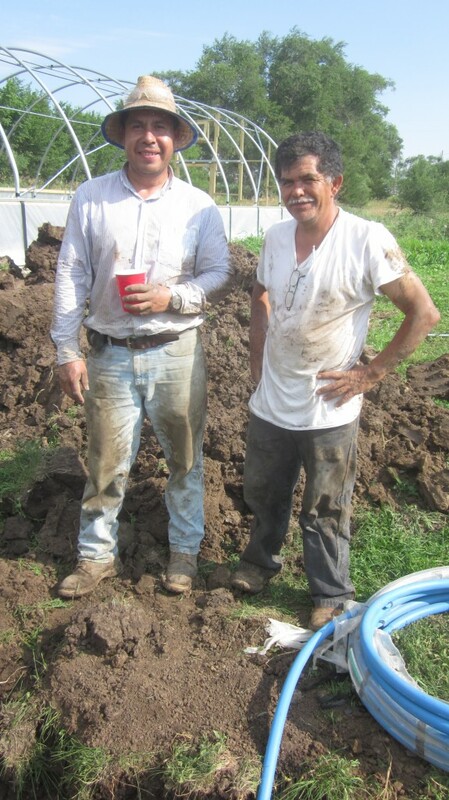 . . after the hydrant was successfully installed, Bryan and Timothy were able to (finally!) build in the north wall. Bryan got a little fancy on this end. He installed a swinging door, for general use, and then a sliding barn door, for when we need to get the tractor in there. Why build just one door when you can build two?? 1. 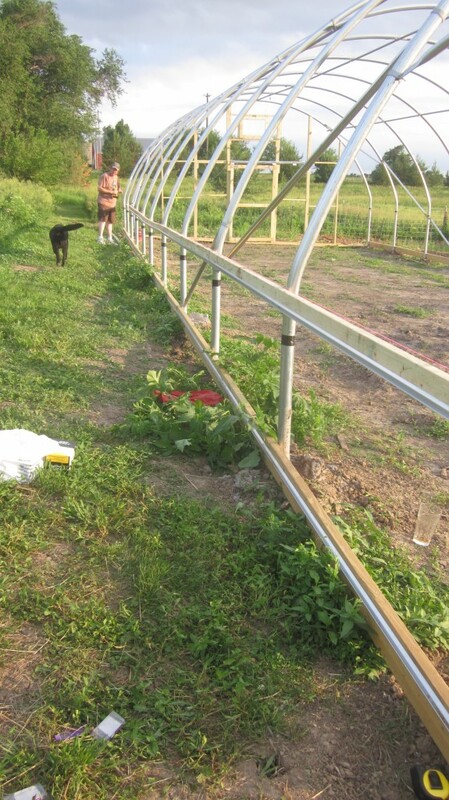 Stretch the plastic over the top and sides, which means that we’ll have to wait for cooler temperatures, (it may be a while) and . . .
2. Haul some manure and spread it around like crazy, and . . .
3. Plant the thing full! Yippee! and . . .
I’d better get planning . . . . .
← Welcome to the world, baby boy! I want to come to your party! I’ll keep you posted, Kim! 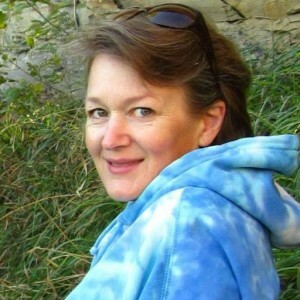 You are a wonderful photo-documenter. (is that a real word?) I am totally caught up in your spirited project by these pix. Nice you included pix of all your workers. It looks like it was hard work but the source of many good memories too! It has been a fun project, but we’re all a bit ready to go on to something new, I think . . . .thank you for your comment! 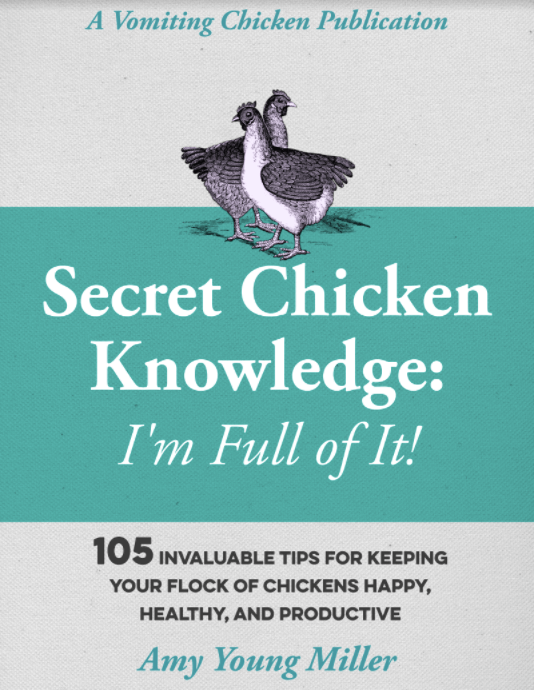 Great post and step on step guide…love your humour and the photos!!! What a great tale. The project looks amazing, you are so lucky to have all of that land. Loving the wiggle wire – must get some for my husband! Oh such a good experience following this project. I want a hoophouse!!! Smaller of course. How awesome! To have the option of fresh veggies and garden splendor all year round. All the hard work will pay off for years to come. I’m really excited to see what we can do with this thing, now that it’s nearing completion!! Looks great! I’ve never heard it called a “hoophouse”. Is it any different from a “greenhouse”? That’s what we call them in NC. 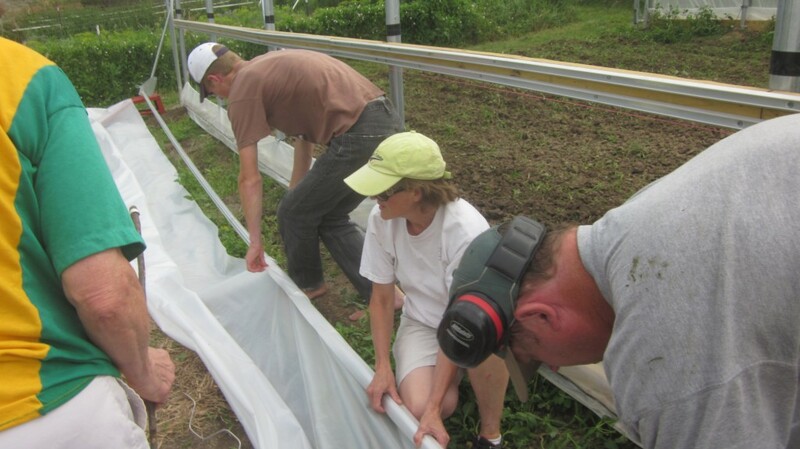 It’s different from a greenhouse in that it is not heated during the wintertime. 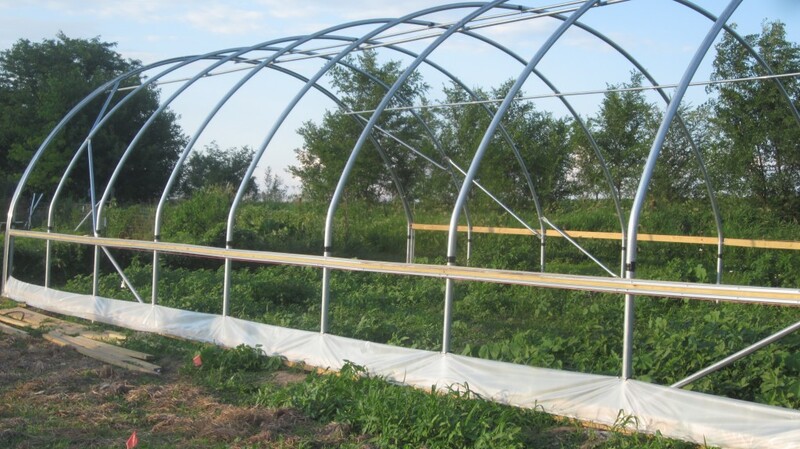 It gives protection to the crops inside until it is very very cold. Then it (and I) take a break from gardening! Wonderful story! 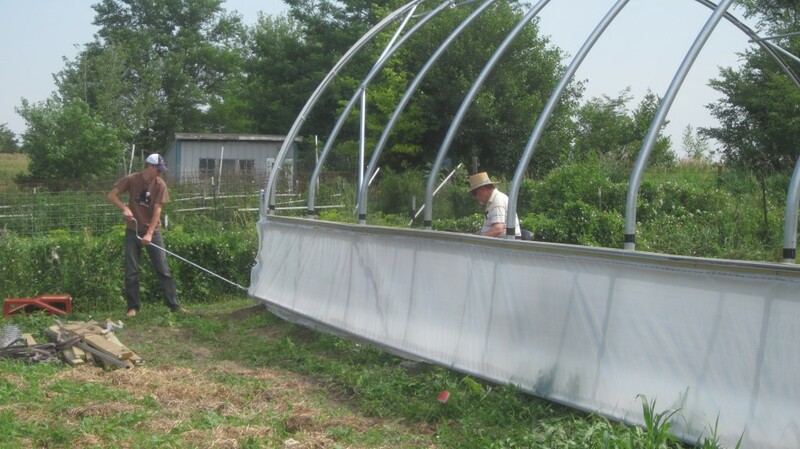 I didn’t know these were called hoop houses. I wish you all the best with it! 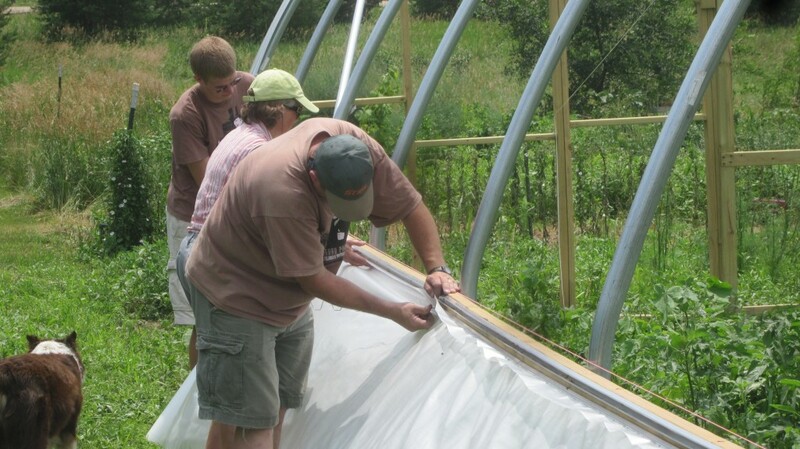 Also they are called “high tunnels.” Thank you! What fun, Amy! It’s coming along soooo well! 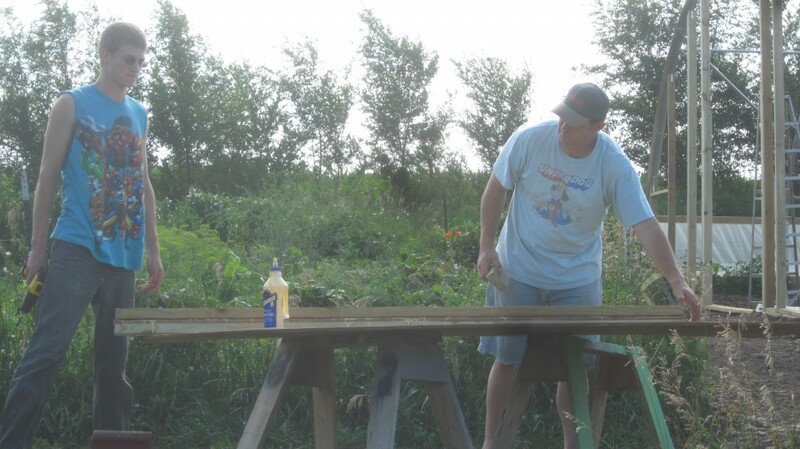 Can’t wait to see the finished project – yippee! You are soooo close! Thank you Carrie! I can’t wait to get it planted! Can I come. 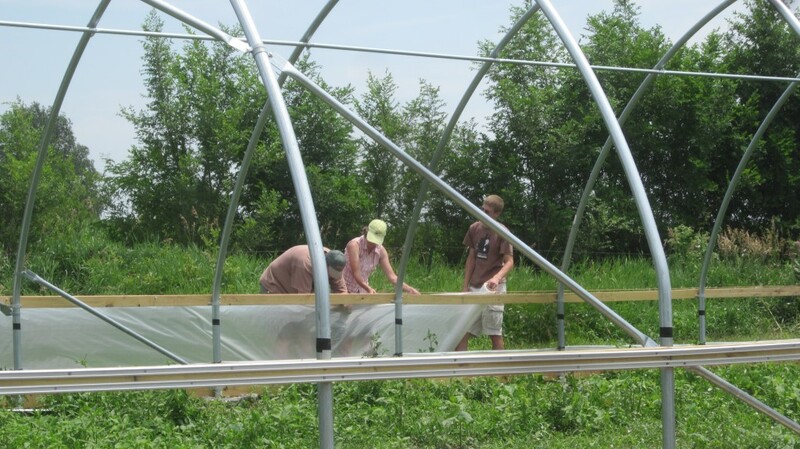 Your hoop house looks awesome. I can just imagine all the planting you’ll do inside. Thank goodness, there were plenty of people to help. Of course you can come. You can consider this your invitation! I’ll keep you posted about the date! Thank you–that’s an interesting idea!! Come to Binghamton, New York in the winter with the produce you’ll be able to winter in this, and you’ll have a lot of customers. I am in awe of the size of this. It IS big, isn’t it? It won’t be heated, so once the temperature really drops, everything will be done for. 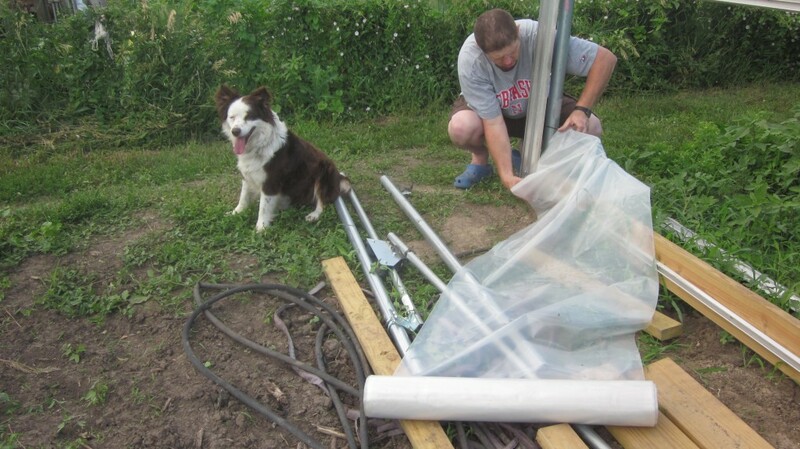 But it will afford great protection from frosts in the fall and in the spring, and I’ll be able to keep a lot of produce growing until late fall. I’m excited to get it planted! You have a great way of telling a story & the pictures really help to bring it to life! 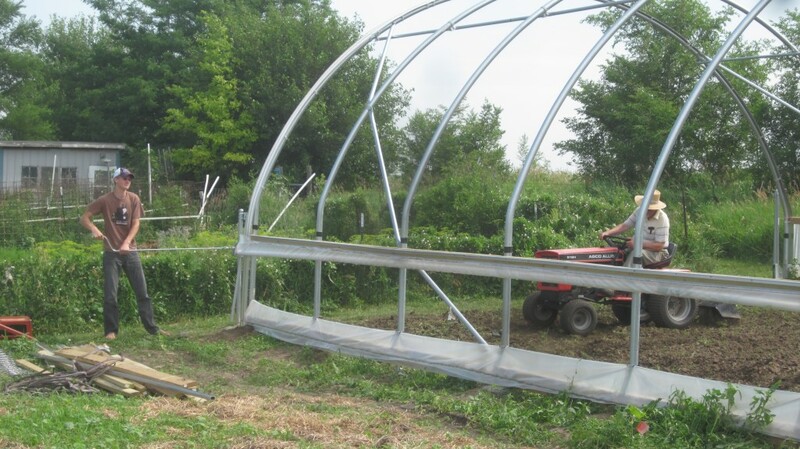 I love your hoop house! Thank you very being so sweet, Sophie. I love it, too! Thanks, Nicole! I’m looking forward to the planting! What an awesome project you guys have a accomplished. This gives me ideas for my own creations. 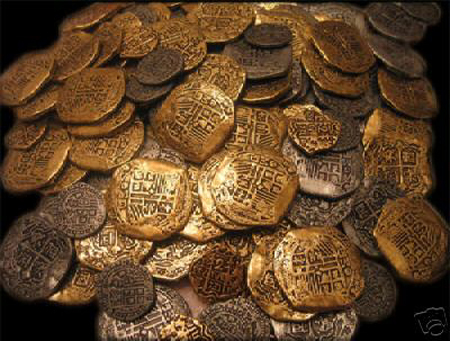 Thanks for a humor and wonderful Spanish doubloons. Thanks Addison, you know you can subscribe too, by entering your email address in the box on this page!